Pen:Lamy Safari, Extra Fine nib. This was a sample I had added to my basket along with other Diamine ink samples from Cult Pens. It isn't a deep red or actually even a bright red. For me this is a pale red. The plus side to this being a pale red is that it has good levels of shading. As you can see from the pictures you get a wide range of depths of red. The drying times have really impressed me, in a matter of seconds the ink was pretty much dry. I don’t think this would work as a everyday ink for me due to this paleness of colour but I actually think this could be a good ink for additional note taking or maybe even calligraphy? I am planning to use it for highlighting corrections in notes I take. I shall feed back how this goes in the long term. 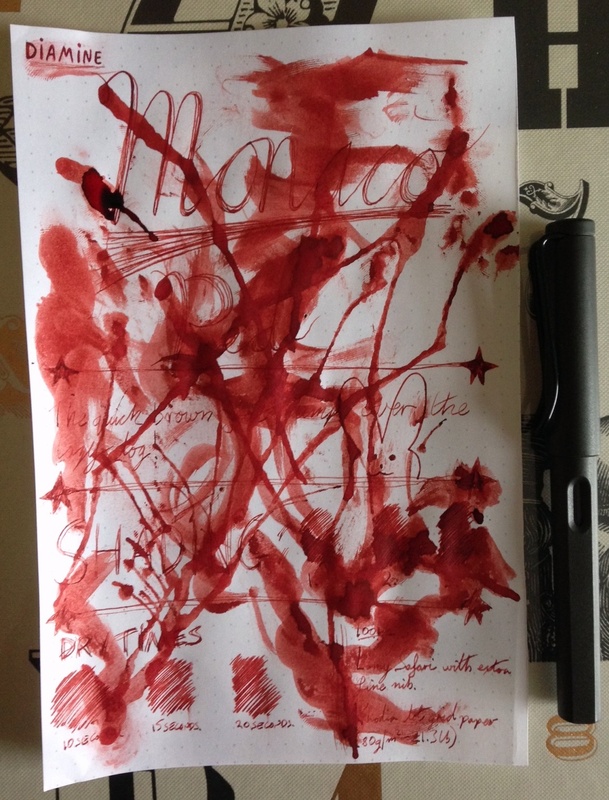 I really would love to see if any of you lovely readers have any red inks you would recommend.